1497: The Cornish rebels cross the River Tamar into England on a journey that would take them to Deptford Bridge in South London. 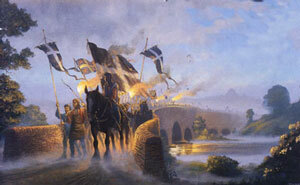 Painted by Donal Macleod and entitled Crossing the Tamar - The Cornish Rebellion. In June 1997, Cornish marchers gathered on Blackheath common in London, England, to commemorate the 500th anniversary of the Cornish rebellion in 1497. This Celtic rebellion, with it's links to nearby Deptford, was the first of three Cornish uprisings between 1497 and 1546. The bridge over the River Ravensbourne at Deptford Broadway has an important place not only in the hidden history of South London, but also in the history of Britain. Here, Wat Tyler and his rebels crossed from Kent into London in 1381 during the Poll Tax rebellion. In 1450, Jack Cade and the Kentish rebels crossed to seize the capital. And in 1497, it was the turn of the Cornish rebels led by Michael Joseph (An Gof or The Smith in Cornish), to do battle on the bridge. At stake was the freedom of Cornwall, then like Wales and Scotland, still in open rebellion against Norman rule in Britain. Wales had only recently been subdued, following the revolt of Owen Glendower in 1412. The Norman King of England saw his forces increasingly tied down in France, Scotland and Ireland. An Gof and his rebels had decided to march on Blackheath in 1497, because they thought they could secure the help of the people of Kent - who had given strong support to Wat Tyler and Jack Cade. But, sadly this was not to be the case. Such had been the repression following the revolt in 1450, that very few people in Kent were prepared to do battle on behalf of Cornwall against the Norman King. The rebels were to be defeated at Deptford Bridge on 17th June 1497. The battle is significant as it represents the last major rebellion against Norman rule in Britain. The defeat of Owen Glendower in 1412 and Michael Joseph in 1497, would only leave Scotland in a state of open rebellion to Norman rule in Britain, and this resistance would only be finally subdued at the Battle of Culloden in 1745. Thus, Deptford Bridge is a major historical site in Deptford - and one whose historical significance has been almost completely ignored by the London Borough of Lewisham - it is, after all, the only place in the Borough where a major battle has been fought. One aim of this article is to raise awareness both locally and nationally to Deptford Bridge as a site where peoples history was made - in this case the English rebels who marched behind Tyler and Cade to demand the end of serfdom and equal rights - who would have had significant support from the local people - and the Cornish Rebels who marched from Cornwall into England and all the way to London to fight for the rights of the Cornish people. From Welles they went to Salisburie and from thence to Winchester, and so to Kent . . . The capteines of the rebels . . . brought their people to Blackeheath. . . Without long fighting, the Cornishmen were ouercome . . . The Lord Audeleie was drawne from Newgate to the Tower Hill in a coate of his owne armes, painted vpon paper reuersed and all to torne and there was beheaded the foure and twentith of June. Thomas Flammocke and Michael Joseph were hanged, drawne and quartered after the maner of traitors.' Holinshed, 1587, edition, vol. ii, p. 782. Thus, apart from Wales, two other Celtic kingdom's survived the initial Saxon settlement: Cumbria and Cornwall. Cumbria - whose name derives from the same word as Cymru or Wales - was to be permanently annexed by England in the 11th century. Although Cornwall had been forced to accept English overlordship in the 10th century, it was not settled or annexed at this time according to Peter Berresford Ellis writing in his book Celt and Saxon: The Struggle for Britain AD410-937. For example, in AD 944, a charter for the Saxon King Edmund had styled him as "King of England and this British province", and laws were enacted in Latin as being "in England and Cornwall", demonstrating as Berresford argues that "Cornwall was regarded as a colonial possession and not part of England"(2). In 1337, Cornwall was created a Duchy, and only the heir apparent to the reigning monarch in England could inherit the kingdom of Cornwall. The two Celtic kingdoms of Wales and Cornwall were to be ruled - as they still are today - by one person styled both as the "Prince of Wales" and the "Duke of Cornwall" - Charles Windsor, the heir apparent to the English throne. Not only is the Prince of Wales effectively the head of state in Cornwall, some Celtic historians and lawyers still argue that Cornwall is still constitutionally separate from England. It still has it's own Parliament, the Stannery, but this is not recognised by the present Duke of Cornwall. In 1508, this parliament was granted a veto by Henry VII of England over laws passed by the English parliament in Westminster. However, it was to be centralisation of English rule in Cornwall, English taxes and suppression of the Cornish language were to be cited as reasons for the "remarkable" Cornish uprising in 1497. The uprising is significant for the fact that it represents the last time that Celtic soldiers fought in London, and that it followed the 1400-12 rebellion in Wales, led by the famous Welsh revolutionary Owen Glendower - an uprising that undoubtedly inspired the Cornish Nation. One major source l have used for the Battle of Deptford Bridge is An Anwan Ha'n Gurun (The Anvil and The Crown), by Cornish language historian, Brian Webb. (3) He describes how the rebellion struck a chord among the impoverished peasants in Cornwall and England. Indeed, when the rebels marched into England, they were joined by Yeomen from Plymouth. By the time they reached the former Celtic territory of Somerset, their numbers swelled as people joined the rebels in what they regarded as a just cause against the English crown. Contrary to popular belief of a stable English kingdom at the time, the country was in a state of constant war and rebellion. The English Kings faced three major rebellions in the 100 years preceding the Cornish rebellion in 1497: the Peasants Revolt in 1381, the Welsh rebellion in 1400-12, and the Kentish rebellion in 1450. The Cornish clearly expected to get popular support behind them, and to be in a position of strength, with the help of Kentish rebels, by the time they got to London. They probably knew that Henry VII was facing an even more serious rebellion in Scotland, and that he was preparing to march an army of 8000 soldiers north to do battle against the Scots. It is thought that the Cornish rebels thought they had a chance to take advantage of over stretched English troops fighting battles both against both the Cornish and the Scots, and needing large garrisons to maintain the occupation of Wales and Ireland. Certainly, Thomas Flamank spoke in public meetings against the imposition of the English subsidy (tax) to raise money from the Cornish war against the Scots. He also compiled a "declaration of their grievances" that the Cornish had with English rule. Added to this problems, England had hardly recovered from the 30 year war known as "The War of the Roses", which devastated the country and climaxed at the Battle of Bosworth in 1485. The Cornish rebels of 1497 were led by two men: Thomas Flamank, the son of estate owner Sir Richard Flamank, from Bodmin. In his twenties, he was an eloquent lawyer in the King's court. Their main leader was Michael Joseph, a blacksmith from St. Keverne, known in Cornish as An Gof (The Smith). Along with Flamank, they led an army of some 3,000 soldiers from Bodmin over the River Tamar into England. Flamank persuaded the rebels that they should march peacefully to carry their grievances to the English king, Henry VII. They had only bows and arrows and simple country tools, and they marched without violence receiving support along the way. Their numbers increased daily and so did their fervour. In Somerset their numbers swelled to over 5,000 and included James Touchet, Lord Audley. They clearly intended to fight for what they saw as justice. However, the English troops sent to engage them near Guildford, commanded by Lord Daubeney, his most senior General and Lord Chamberlain were defeated. Following this success, the Cornish marched on Blackheath Common. This they had done because they expected to get the support of the Kentish rebels led by Cade who had rebelled some 40 years earlier in 1450. They had approached London from the south expecting their support but this was not forthcoming - probably due to the severe repression that followed the revolt in 1450. The rebels reached Blackheath Common on the 16th June 1497 The day of the battle is best described by Webb, who describes how An Gof and his army were encamped "at the top of a hill" with the intention of charging down on the English troops. I would take this to mean that An Gof and his troops were encamped at The Point, which then would have given them a panoramic view of Deptford and the surrounding area, with the City of London visible in the distance. "Next morning, the hill was surrounded and Daubeney was sent to attack the bridge, and at six o'clock, a group of spearmen under Sir Humphrey Stanley moved forward, they soon broke (through) the rank of the Cornish archers. The greater part of the Cornish army was too far behind to give assistance. As their was no second rank of archers to give support to the first, as they were regrouping after the English attack, they were no equal to Stanley's soldiers". Henry VII was said to be delighted and gave thanks to God for deliverance from the rebellious Cornish. An Gof joined Flamank and Audley in the Tower and a week later they were tried and condemned. An Gof and Flamank "enjoyed" the king's mercy by being hanged until they were dead before being disemboweled and quartered. Their head's were then stuck on pikes on London bridge. Audley's sentence was "commuted" to beheading in the Tower of London. These were not to be the last rebellions by the Cornish: they were followed by others in 1498 and 1546, which were brutally crushed. Recently a Cornish council refused permission to erect a statue to An Gof and the Cornishmen because as they had rebelled against the English crown. So far, to the shame of successive local councils in Lewisham and Greenwich, only Daubeney has been remembered in South east London: A tower block was named after him in Pepy's Estate, Lewisham. This monument was commissioned by the An Gof Sculpture Trust and created by Terence Coventry as a memorial to the Cornish Uprising in 1497 and in celebration of it's 500th Anniversary. "A NAME PERPETUAL AND A FAME PERMANENT AND IMMORTAL"
1 That the Celts themselves would forever known as "foreigners" in their own land - the island of Britain - is also described in The Grail Legend by Emma Jung and Marie Louise von Franz. They point out that in some versions of the Grail mysteries, the knight Perceval was designated as a "Welshman". This was then a racist term used to designate "a primitive, uncultivated, and somewhat inferior man". Grail historian Geoffrey of Monmouth said that the name Galois (or Welsh) was derived: "When the foreigners, i.e. the Saxons invaded the country, the Britons were no longer known by that name, but were called the Guallenses, which derives from Guallo . . . the word for foreigner" According to F. Kluge in Eytomologisches Wörtenburch der deutschen Sprache, the word "Welsh" donated both a slave and a Celt. The use of the word "Welsh" for "foreign" is still to be found in the German-Swiss designation of Welschland for French Switzerland. Both quoted in The Grail Legend, Emma Jung and Marie Louise von Franz, Sigo Press, Boston, MA, USA, p49. 3 An Anwan Ha'n Gurun (The Anvil and The Crown), Brian Webb, Kowethas an Yeth Kernewek (The Cornish Language Fellowship), Truro, Kernow (Cornwall), 1981. Information for this article was also taken from Cornwall Online, September 1997.